While it is reassuring that the need to ‘see’ us suggests that the potential overthrow of the teaching role is greatly exaggerated, we are more interested in establishing good dialogues with our participantsand encouraging them to fashion their own ways of engaging with the course material than we are in attaining guru status. Our introductions and hangouts are still not ‘lessons’ as such, but give us an opportunity to provide guidelines to the kinds of connections we are seeking to make between education and digital cultures and, in the hangouts, to focus on the work being produced by MOOC participants. And some of these connections challenge the very notion of ‘the human touch’ that our televisual selves might seem to offer. Our email to those signed up for next session of EDCMOOC has just gone out. Although the MOOC doesn’t officially start until November, students are already tweeting, blogging and generally getting to know each other. There is also a community of EDCMOOC1 participants still active in Twitter and elsewhere, and one of the really fascinating things this time will be to see if and how these two groups connect with each other. There are currently over 11,000 students enrolled for November and we’re looking forward to meeting them. This is only the second time we’ve run the MOOC so it will be interesting to see how the cohort dynamic plays out here. EDCMOOC2 will have the same open structure, encouraging dialogue through blogging, Twitter and a range of other social media as well on the Coursera site itself. We’ve made some changes in response to issues raised by the previous cohort, while maintaining our commitment to an exploratory and critical approach to digital cultures, to e-learning and to the whole idea of MOOCs themselves. Some participants reported that they felt overwhelmed by all the activity on the site and beyond. We realized that some people were trying to follow up all possible conversations – the numbers meant it was impossible even for the five tutors to do that. On the site, there will be a page of strategies for dealing with the ‘massive’ aspect of the MOOC. We’ve tried to help orientate people through adding some video introductions to the five tutors and our themes, but we’re still not using the traditional ‘talking head’ lectures that some students may have come to expect through taking other MOOCs. The two Google hangouts we ran last time proved very popular, and in EDCMOOC2 we’ll have one on the Friday of each week. This way, participants can hear our discussions about the course as it progresses. But the main ‘content’ will still be created by the participants themselves as they critique the films and readings we provide, and form their own understandings about the issues involved and their implications. We loved the digital artefacts produced by our first cohort and heard reports of some fantastic feedback from fellow participants. There were also some less positive views of peer feedback: we’re revising our advice on this and have agreed that it’s fairest not to focus on grades, but to create a pass/fail classification instead of 0/1/2 that we had before. Some people reported that didn’t manage to submit because of confusion about timezones and the deadline for the assignment – we’re taking steps to minimize this for the next cohort. Our approach will not suit everyone; the massiveness of MOOCs often seems to be the first thing that people want to try to control or curtail. We still find it new and exciting ourselves: we’re continually revisiting what teaching means at this scale. We’ll still blog here about this occasionally. We’re really happy to be doing this again. Hello all. This is a guest post from a University of Edinburgh colleague of the EDC MOOC course team. My name is Anne-Marie Scott, and I’m the Technology Enhanced Learning Services Team Manager, the shorthand of which is, I look after the IT side of the University eLearning services. I gave a (very) small amount of help with the EDC News site that was used as part of the EDC MOOC, and now that there has been a little time to pause and reflect, it seems like a good time to talk about the site, and, in particular, to get a little technical about what was done, how and why. In the greatest part we were only able to do what we did because of others who had generously shared their own experiences, hints, tips and tricks via blogs and online tutorials. On that basis I think it’s fair to say that our site was mostly an assembly of good ideas from others, but hopefully this post could help someone else looking to do something similar. The EDC News site was to function like a daily newsletter, aggregating posts about the course from various personal blogs. Over the lifetime(ish) of the course 931 urls of peronal blogs were submitted for aggregation. The collection of blog urls generated around 1340 posts within the news site and from what we can see it looks as if posts may have come from as many as 300 out of the 900+ different blogs. Google analytics reports that the site was visited around 1430 times by 997 unique visitors. Half of the visits to the site were from people who had visited before and almost everyone only visited the first page of the site. The front page of the site is set up to show 100 posts, and you can see from the graph below that at the rate new posts were added to the site, a post was likely only to stay on the front page for a couple of days at best. The eagle-eyed will have already spotted that the EDC News site uses WordPress, and the key piece that makes this all work under the bonnet is the FeedWordPress plugin (we did consider gRSSHopper as an alternate solution to WordPress but ruled this out). Much kudos and credit must go to Martin Hawkesy at JISC CETIS at this point. His immensely helpful post on MOOC aggregation was the best source of information, bar none, for deciding on which tool to use. The final piece of the puzzle around how to manage collection of the blog urls from course participants was put together by Jeremy Knox based on a very neat tutorial about using a Google spreadsheet as the source of a Yahoo Pipe. Jeremy and other course colleagues also took care of the visual style of the site – a big plus for using WordPress as this is easy to do. Blog urls are submitted by course participants to a Google spreadsheet. A series of Yahoo Pipes grabs 20 of the blog urls, loads up their content and filters out anything with the #edcmooc tag. An aggregated RSS feed from the pipe is fed into FeedWordPress. The FWP+ Limit size of posts plugin truncates the incoming posts and creates the ‘Continue Reading’ link to the source blog post. The feeds are run manually once a day (due to some local server constraints, but you could automate this with a cron job). Yahoo Pipes has a 30 second timeout – hence chunking up the feeds into batches of 20 – this seemed to be the optimum amount. I also added a ‘last 72 hours’ date filter to avoid the feeds getting too big over time. FeedWordPress also has a timeout. By default it is 20 seconds – increase this to match the 30 second timeout in Pipes. Quite a few of the urls submitted had problems – some admin/curation is always required. Quite a few also contained no #edcmooc content – urls are often submitted with the best of intentions. To conclude, this proved to be a reasonably quick, and very cheap way of doing blog aggregation with tools that didn’t require a high degree of technical intervention to keep things running. After the initial setup, most of the work was ‘administrative’ (making more pipes, adding feeds to WordPress, updating the feeds) and with clear instructions is pretty accessible to do. The dust is settling and we are beginning to get a sense of the overall impressions left by the EDCMOOC experience. We’ve been extremely grateful for the time that participants have taken to reflect on the course, in the discussion forums and in their blogs. We’ve also got some feedback via a survey we released a couple of weeks ago, from a range of people – from those who never logged in to those who formally completed the course, and everything in between. We’ll aim to share more details of this survey and its results as soon as we can. Some very positive news for us is that a large majority (82.8%) of those survey respondents who actively participated in EDCMOOC said that overall their experience was good, very good or excellent. The following feedback was pulled from blog and forum posts, and doesn’t yet include the survey response feedback. We’ll be continuing to work on drawing this together, but we wanted to get some of this information out as soon as possible. The feedback we’ve gathered falls into five main categories: connections, content, course design, teaching and assessment. Content. Those who ‘got’ it were, for the most part, happy with what was on offer and engaged and excited by the topics, discussion questions and resources. We pitched the course at what we felt was an introductory level, and some thought our approach was oversimplified, which highlights one of the primary challenges of developing an open course – there is no way the level can be right for everyone who might sign up. However, even setting this aside, there is still some work to be done to ensure that everyone who participates in the MOOC understands the purpose of the course, and knows what to expect in terms of the content and our approach to the subject area. There were a number of posts in the forum in particular that indicated that the course content wasn’t what some had expected or wanted, and this was reflected in objections to the cultural angle, the theoretical aspects of the course, the lack of practical advice about course design, and so on. We have tried to clarify in the course description what is, and is not, on offer in this course. One of the other main things we want to focus on for next time is better articulating what we see as the vital need for educators and e-learning practitioners to be critical consumers and producers of ‘stories’ about education and technology. This is the key purpose of this course, and we will be working to ensure that these critical perspectives are foregrounded, discussed and debated at every stage of the MOOC. Connections. The pleasure and excitement of the ‘massive’ was experienced, for most people, alongside a sense that they were making satisfying connections – whether fleeting, or ongoing. Where this didn’t happen, the MOOC sometimes felt disorientating and overwhelming. As one participant put it, “those students who were fortunate enough to make meaningful connections with other students probably gained the most out of the course”. A key message we are getting from this first run is that more people wanted a sense of connection than were able to achieve it. This may be due in part to differences in familiarity with social media spaces (where a lot of the most meaningful connections were made), and to the point at which people began to engage with the MOOC (some started very early – well before the formal course launch date). Next time the MOOC runs, we will seek more ways to support those who want to make meaningful connections (while leaving ample room for groups to self-organise, for cross-fertilisation to take place, and for people to work independently – all of which we think is really important). Course design. There were a number of aspects of our course design that drew comment. Strengths were seen in the pre-arrival information and encouragement to network; the value of having MSc in Digital Education students as teaching assistants; the flexibility of the course (in terms of content, environments and activities) and the ability to take many different kinds of approach. More mixed feedback came about the timings (a mix of responses about whether 5 week was just right or not enough, and some comments about the suggested workload of 5-7 hours per week being unrealistic); and the ‘massive’ nature of the course (exhilarating vs overwhelming). Teaching. While some commentators appreciated that the course was designed to foreground the voices of participants, many comments related to a desire to hear more from the MOOC teachers. The desire for more of everything from the teachers – hangouts, structure, guidance, discussion participation – gives a strong indication that MOOC participants need and want teacher presence to be high-profile, ‘in your face’. We’re actively discussing ways we can make our presence more felt in the MOOC. Assessment. The final assignment – the digital artefact – supported a level of creativity and engagement that was really impressive, both during the preparation period and after submission. For many, the experience of creating their artefact was, in itself, of great value, and others found the peer assessment process challenging and fruitful. There was a sense that participants would have valued some practice with the peer assessment tool, and with creating and giving feedback on artefacts. Some very constructive suggestions were made about the markers’ process of interpreting the artefacts: that the assessment criteria may have rewarded ‘literal’ interpretations of the course material rather than more abstract/adventurous/creative ones; the possibility that a short statement/self-reflection about the artefact (an ‘exegesis’) might help markers engage more with the creator’s intentions; and that finding a way to allow people to set their own learning goals and be assessed on these might be in keeping with the ethos of EDCMOOC. Finally, questions were raised about the scale (0-2), the automated awarding of ‘distinctions’ for combined peer grades over a certain threshold, and the lack of opportunity to respond to peer feedback (a feedback on feedback mechanism). These are all things we are considering carefully, and talking to Coursera about. In summary, we’re working out how to make EDCMOOC even better next time in response to the feedback participants have shared, and where platform issues arose, we are raising these with Coursera. 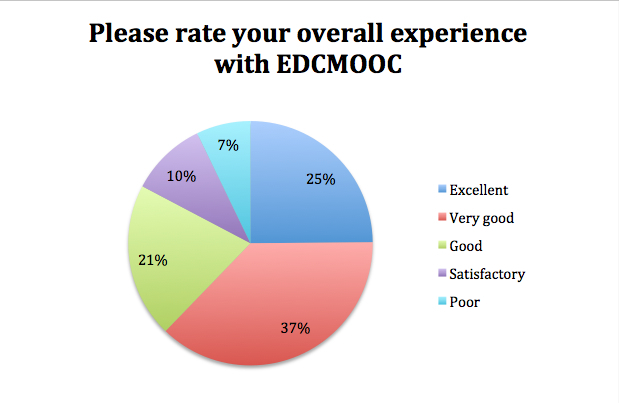 Thank you very much, again, to all those who participated, and all those who have shared their insights about EDCMOOC. While, as I have made clear in previous posts, I welcome criticism, the above observation has become particularly cherished. Despite my genuine respect for Wilko’s concerns, the analogy is, for me, undoubtedly complimentary. From the outset of planning this course, we have been very much interested in challenging the boundaries of what is possible with an ‘online’ course, and this description seems to encapsulate these attempts very satisfactorily indeed. I use the word ‘challenging’ here intentionally, aware of its vagueness. ‘Subversion’ might be another term appropriate to our strategy, although I wouldn’t necessarily use that here lest it be taken negatively. Our relationship with Coursera is of course a partnership and collaboration, within which we are both working to confront assumptions about what is possible with digital education, and our intention is to productively experiment with the platform for the benefit of those learning with it. Neverthless, Wilko’s above allegory is a fantastic way to begin considering what we may have achieved with the EDCMOOC. Duchamp’s ‘Fountain’ of course comes to mind, and perhaps other Dada works comprised of ‘readymade’ found objects stated to be art – this is presumably the trend which is being referred to. I am of course not attempting to equate our five week course with such a movement, however it may provide a useful starting point to consider our course. As described in Sian’s earlier post, we did indeed structure our course around objet trouve – open source resources on the web – and presented or curated these objects *as* our course. In this sense, we did indeed smuggle a sardine can into the Coursera platform, and presented it as a course. However, what Wilko fails to include in his compliment is the conversation that has been happening in art since Duchamp’s ‘readymades’ in the early twentieth century; that of the relationship between the object itself and our appraisal of it. To attempt to crudely shoehorn such an idea into the discussion of our very own EDCMOOC, would be to say that there is a conversation to be had about the content of a course, and the discussions and responses that happen around them. To privilege course content as being in possession of essential and hallowed qualities, anterior to the ways that the viewer approaches it, is to ignore all the ways that knowledge derives from processes that involve human interpretation. Just as an everyday object with a non-art function can change depending on the context in which it might be placed (a gallery), or the interpretations which might arise in response to it, so any object can prove the most stimulating educational resource. Just think what kind of issues could be brought to fore in a consideration of the humble sardine can: industrialisation, mass production, globalisation, fishing stocks and quotas, human relationships with animals, to name but a few over-generalised topics. Before I take this artistic analogy too far, I must say that I don’t think the EDCMMOC has been particularly radical. There is of course a much more revolutionary history to the MOOC, in which our offering is merely a ‘hybrid’, trying ‘very hard to subvert its own conditions of production.’ However, given the relatively experimental and emerging format that is the MOOC, about which my ever insightful colleague Hamish has been known to paraphrase Zhou Enlai, declaring ‘it is too soon to say’, I hope that we have indeed done something to subvert the idea that MOOCs are incontestable lectures, alongside which our interpretations, creativity and oppositions are secondary. What has been most thrilling for me in this EDCMOOC are the thriving tweets, blog posts and group conversations that are orbiting the Coursera site. Thousands of them. That is the power, and value, of a well placed sardine can. …what are the learning outcomes for which this course was designed? Which outcomes are served by each of the segments? How will we assess our progress towards these outcomes? Just over a decade ago, I asked staff and students at the university where I worked (not the University of Edinburgh) What is a learning outcome? I heard from 111 staff, mainly academics, and 260 students. I received some fascinating responses, but unfortunately my institution didn’t want me to publish them. I could identify two main broad categories: a result and an anticipatory statement or intention. A third category also emerged when I looked at student responses – an aspect of a course, particularly assessment. My study threw some light on some mismatches I could see in staff and student expectations. I suspect there is still some ambiguity about this term, and our EDCMOOC has strengthened this feeling for me. My own preferred emphasis tends to be on results, but I do understand the strength of adding the word ‘intended’ as well. In terms of a result I think an artefact is a very clear outcome. But look at the range of learning embodied in these artefacts: here’s a link to a fantastic student-created collation of some of them. Could we have anticipated what people would have learned? What statements of intended outcomes would have done justice to what has emerged? And what about the learning outcomes achieved by people who haven’t submitted? Stating intended learning outcomes can be very useful for many courses. It helps teachers with planning their course design and students with knowing what’s expected of them. But what’s been happening on our course here does suggest that it’s worth revisiting the words of Lawrence Stenhouse, writing in 1975: ‘Education as induction into knowledge is successful to the extent that it makes the behavioral outcomes of the students unpredictable’ (p. 82). There are more recent challenges to learning outcomes too, including this call to resist them. I’ve done my share of teaching academics – and even also our students on the MSc in Digital Education – about course design using learning outcomes, but that does include applying a critical lens. One of the challenges of MOOCs is measuring outcomes. Since most of your students are educators we should want to help measure the outcomes. I would recommend you send us students a survey, perhaps every six months for the next two years, to see how we are using the materials and how we evaluate the course over time. This is an interesting idea. I once had a ‘learning outcome’ eight years after the input: I remember suddenly being aware of what ‘that woman at the conference was getting at’. Her presentation had clearly been memorable, but I did not have sufficient pre-requisite knowledge in my repertoire at the time to process her meaning. This experience reinforced my view that simple statements of outcomes in relation to a course may encourage a distorted picture. How often and what intervals is it meaningful to check on outcomes – and how can we be sure what to attribute them to? I accept that we will have lost some students because we did not explicitly state learning outcomes and show step by step how they would be achieved. Even those students, I would argue, are likely to have left the course with some important learning outcomes that are specific to themselves. From a teacher’s perspective, there have been many learning outcomes from this MOOC. I think I have experienced several just from looking at the Twitter feed and discussion forums this morning. There have been adjustments to my understanding of, for example: responses to automation, language and cultural perspectives in a globalised course, interpretation of messages, the role of peer assessment as a learning opportunity, what is (not) possible when assessing at scale. And there will some I haven’t even begun to process yet. To everyone involved: I hope that your own learning outcomes from EDCMOOC have been satisfying, but not to the extent that you want to stop pursuing the topics to achieve more. I have certainly been energised by seeing the outcomes of the past five weeks – and I still have a lot more to look at. Stenhouse, L. (1975) An Introduction to Curriculum Research and Development. London: Heinemann Educational Books Ltd.
Quite a few of us participating in the MOOC have been wondering what next (see Jen’s blog post), so I thought it might be useful to share a few suggestions for further and future reading according to the themes we’ve been looking at. In particular, what writing is out there which brings together popular culture, posthumanism and education in ways which resonate with what we’ve been doing in the latter half of the MOOC? For me, some of the best writing on posthumanism emerges in the analysis of popular culture, from Shelley’s 1818 Frankenstein (discussed by Elaine Graham, 2002, here) to Wolfe’s 1952 Limbo (see N K Hayles’ discussion in How We Became Posthuman, 1999) and Byrne and Eno’s 2006 re-release of My Life in the Bush of Ghosts (which Cary Wolfe, 2010, talks about in his book). Such work brings pressure to bear on the very distinction between ‘fact’ and ‘fiction’, ‘science’ and ‘art’ – yet another set of binaries we’ve negotiated around at several points over the last few weeks – as it traces our various attempts to make sense of scientific incursions on ‘the human’, while at the same time mapping multiple possible futures for those same scientific trajectories. So there’s some great recent work which reads education and posthumanism alongside popular culture, showing how rich such an approach can be. Helena Pedersen’s (2010) meditation on posthumanist theory, educational philosophy and animal studies via a reading of Atwood’s Oryx and Crake and Ishiguro’s Never Let Me Go is one cracking example. Another is Gough’s 2004 proposal for a posthuman pedagogy using Mayakovsky’s Cyberantics as exemplar and model (see the paper outline here); yet another is Lewis and Khan’s working through of the notion of ‘exopedagogy’ (2010), which arrives at a proposition for posthumanism in education via readings of culture from Victor the ‘wolf boy’ to David Icke’s reptoid aliens and ‘fairy faith’ subcultures. It is interesting to speculate about how MOOCs might evolve, and about what they could become, or transform into. Thinking about “evolution” predisposes me towards biological metaphors. Is the massive going to swallow up the small, for example? In the biology of reproduction we can see two extremes in strategy; one which goes for high quantity of offspring, and depends on the survival of a few (like an oak tree), and one which goes for high levels of parental investment in a few offspring maximising the potential of survival for the few (like a penguin). So it is likely that there will always be room for both the big and the bijou. But I have been thinking abut another biological metaphor, stimulated by seeing that there appear to be a number of smaller, pre-existing groups of participants working together within the body of the MOOC as a whole. In some cases these have been groups of colleagues who have covenanted together to participate in the MOOC, and then to communicate, and to discuss their experiences of the MOOC in this smaller, collegial context. In other cases there appear to have been groups defined by membership of existing formal course cohorts, who are participating in the MOOC as an element of the work for those courses. Might this be early evidence of one potential evolutionary trajectory that MOOCs could take, as weakly interacting assemblages of other learning entities? The metaphor that I want to explore then, is endosymbiosis. This idea can be traced to the early 1900s, but came to prominence in the work of Lynn Margulis in the 1960s. In brief, the modern membrane-bounded cell is thought to have come about by the fusion of two ancient cell types – what we would now think of as bacteria and archaea. The larger swallowed the smaller but, rather than the smaller poisoning the larger, or the larger digesting and assimilating the smaller, a reciprocally beneficial relationship came about, and persisted. So now, we all have cells with little power generators called mitochondria (if we are animals) and with these mitochondria and also tiny solar collectors called chloroplasts (if we are plants). What about a massive aggregation of learners brought together – at least in part – through collections of smaller learner groups? The smaller groups will be the source of the motivation and energy, and the larger whole will provide structure and resource. I’ll have to think this one through further. But at the moment, I don’t know whether I am coming or going. Thanks Andy. That’s what I call a digital artefact! The start of EDCMOOC was hard to pin down, and it’s clear it will not end simply, either. There is still so much to do, and so much to say. So, while I have every enthusiasm for the ideas people are sharing about how to stay in touch, how to keep the work of EDCMOOC going, how to sustain and grow the network, I also believe that these things have to have a purpose and a driving force that is post-EDCMOOC. Having said all that, I am more than content to appreciate what unfolds next, whether or not I see it as departure-like. But if others find this idea interesting, some questions might be: what work do you want to do next? What project can you start, what event can you plan, what course can you develop? What should your EDCMOOC become? The answer will be different for different groups and individuals as you move on from this (partly) shared experience, which is as it should be. I hope that people will keep using the tag where relevant, sometimes, as a marker that ‘EDCMOOC was here’. But EDCMOOC itself is a happening, and happenings are of a time. They are openings, made to be passed through. Kazmer, M. (2007). Beyond C U L8R: disengaging from online social worlds. New Media & Society 9(1); 111-138. Over the past 15 years, I have been researching student experience and use of language through being a student: in a new subject area (first mechanical engineering, then digital education); in a new mode (fully online); and on a new scale (a MOOC). It’s hard to get published in reputable academic journals on this topic, probably because it seems too subjective. One anonymous reviewer wrote: ‘Can staff/researchers ever really become students in any meaningful sense?’ My response to that question is: ‘Yes, they can, and indeed it would probably help their practice.’ I’d even say that – in a very meaningful sense – researchers should never stop being students. Of course there is a danger in assuming that my own student experience is generalisable: that would be foolish. But being a student provides insights on processes of learning as they happen – and before they become ‘fossilised’ as Vygotsky wrote in Mind in Society (page 64). Many of our EDCMOOC students are teachers who are doing the MOOC to find out what it is like to be a student on one. (Some teachers are auditing the MOOC – also useful, but not the same as being an active student.) Being a student provides a great opportunity to see first hand not only how other teachers design a MOOC but also how many different students respond to it and how meanings are jointly constructed. And at the time that it happens. Blogs are great for recording these moments; we forget them so easily once we’ve passed from not-knowing to knowing. We all bring resources and repertoires from previous experiences: no student comes to a course with a blank slate. And nowhere is this more obvious than on the EDCMOOC. Students of all kinds (not only teachers) are sharing insights, aha moments, experiences, techniques, software, and many other resources. This sharing is important for peer support; teachers also learn from it. This always happens in a course; every time I mark an excellent assignment I increase my own knowledge and teaching repertoire in some way. It often happens with less than excellent assignments too. Here, it is happening on a huge scale. I’ve lost count of the new ideas stimulated by students I’ve had over the past four weeks. I only hope some of them stay in my head long enough for me to do something with them. All the recent posts in ‘Teaching E-learning and Digital Cultures’ show that our whole team has been enriched by what the students have brought to EDCMOOC. We’re learning too.